Donald Trump tweeted Sunday morning that in order to end the partial government shutdown, the U.S. Senate should “go to 51% (nuclear option)” instead of the normal 60-vote parliamentary procedure required to end debate. Majority Leader Mitch McConnell is currently opposed to such an option to deal with the current budget negotiation impasse that faces Capitol Hill. The seating of Alabama Democrat Doug Jones earlier this month closed the control of the chamber to just two seats – 51 to 49 – such that even if senate Republicans were able to uniformly support a proposed spending bill, they would still need the support of nine Democrats. And just as the nation has become more and more ideologically divided since the turn of the 21st Century, control of the senate has become unusually narrow. Since the chamber first seated 100 U.S. 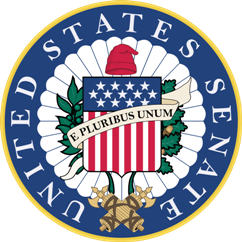 Senators during the 86th Congress in August 1959 after Hawaii achieved statehood, party control was never as slim as two seats all the way through the 106th Congress ending in 2000. The narrowest advantage any caucus held during this period occurred at the close of the 99th Congress in November 1986 after North Carolina Democrat Terry Sanford defeated appointed Republican Senator Jim Broyhill in a special election. That closed GOP control of the chamber to 52-48 for the remaining two months, after which the 100th Congress convened with a 10-seat Democratic advantage (55-45). There were also slightly larger 53 to 47-seat advantages during portions of the 97th (1981-1982, GOP), 99th (1985-1986, GOP), 103rd (1993-1994, Democratic), and 104th (1995-1996, GOP) Congresses. However, since the convening of the 107th Congress in 2001, partisan control of the U.S. Senate has been consistently much more precarious. Of the 6,227 days from the 107th Congress through the 115th Congress on January 21, 2018, Democratic or Republican caucuses have held onto power of the chamber by two or fewer seats for 2,198 days, or 35.3 percent of the time. Republicans then held a 51 to 49-seat advantage during the entirety of the 108th Congress (2003-2004, 731 days) with Jeffords still caucusing with the Democrats. Overall, since the chamber expanded to 100 members in 1959, there have only been 272 days in which a caucus’ advantage was slimmer than the two seats currently held by the GOP. The 51-49 split in the 115th Congress has tallied 19 days through Sunday – a number that will continue to grow through next January 3rd barring a resignation or death in the chamber in 2018. Next: How Many US House Seats Will Pennsylvania Democrats Gain in 2018? 2 Comments on "A Brief History of Narrowly-Divided Partisan Control of the US Senate Since 1959"
There were some periods of very narrow control in the 96 member Senate of teh early 1950s. Yes – from the 82nd through the 85th Congresses I believe almost the entire 8 years was w/in a few seats.